Charleston is a vibrant, bustling city in the heart of South Carolina enriched with cultural heritage, architectural beauties and charming historic Charleston hotels that are reminiscent of days gone by. Charleston is steeped in American nostalgia - its roots in the traditions of the pre-Civil War era. Charleston's historic downtown is a trendy gateway to popular tourist attractions, such as Charleston's Antique District, the French Quarter District and the Navy Yard Historic District nearby to "Museum Mile." World class restaurants, nightclubs and boutiques are a short walking distance away from historic Charleston hotels. Located in Charleston's Old and Historic District, the luxurious Wentworth Mansion is a destination unlike any other offering unparalleled amenities and services. 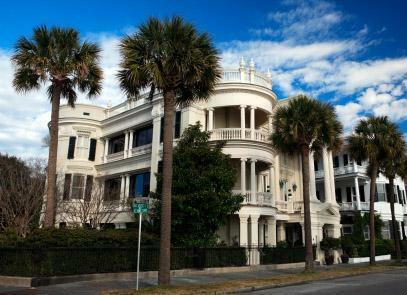 Rodger's Mansion, once a private residence in 1885, was renovated in 1998, reopening as Charleston's finest historic accommodation on Wentworth Street. Sip on cordials in Rodger's Library, dine in an elegant garden setting at Circa 1886, or relax with a soothing massage at the Wentworth Mansion Spa. Daily complimentary courtesies for guests include hors d'oeuvres and wine served in Harleston Parlor and cordials in the evening. The Francis Marion Hotel, located in Marion Square Park right in the heart of Charleston's Historic District, is central to Charleston's historic mansions, Charleston's Harbor, quaint antique shops and a vibrant nightlife. Restored in 1996, the hotel preserved its 1920s atmosphere and refurbished with modern amenities, such as a world-class spa with a 24-hour fitness center, 5,000 square foot conference center, business services and a restaurant with piano bar. Hotel services offer Old World tradition with doormen, bell service, valet parking and opulent guest rooms. Located in the center of Museum Mile, less than a mile away from Charleston's Old and Historic District, Mills House Hotel is central to many of Charleston's exciting attractions, such as the Dock Street Theatre, the City Market and King's Street Antique District. This restored historic hotel offers a charming Victorian atmosphere decorated with resplendent antique furnishings and rooms overlooking Charleston's historic district. Modern conveniences and hotel amenities include an outdoor pool with deck, fitness center, hotel restaurant and entertainment, extensive meeting rooms and business services. Just minutes away from Museum Mile, Charleston Place Hotel is located in the hub of Charleston's historic landmarks and tourist attractions. Nearby attractions include The Battery, the City Market and historic churches. This Charleston premier hotel provides guests with luxurious accommodations, world class services and panoramic views of the historic district. Your spacious well-appointed guest room includes complimentary access to the day spa, health club, sauna, steam rooms and Jacuzzi. On the rooftop, guests can relax at the rooftop pool or The Club: a private level offering a range of exclusive concierge services and dining. Nestled in the heart of Charleston's historic French Quarter District, the French Quarter Inn overlooks the historic City Market and St. Phillip's Steeple. The small yet luxurious hotel consisting of fifty guest rooms is a historical landmark featuring 18th century French urban decor, gourmet restaurant, 24-hour business services and boutique shops located on the premise. The French Quarter Inn offers all the amenities one expects from a luxury hotel, plus complimentary welcome amenities, afternoon wine and cheese and a daily continental breakfast. Charleston is a large city bustling with diverse accommodations tailored to please most world travelers, from budget Charleston motels, boutique hotels, bed and breakfast lodging and quaint inns. Much of Charleston's lodging is nestled in pre-Civil War antebellum homes, mansions and heritage landmarks designed for travelers who prefer an intimate setting over a busy, historic hotel; yet, want to enjoy the Old World charm of historic Charleston travel.